Remove bandage after 1 hour. Wash tattoo with warm soapy water. Apply thin coat of tattoo goo 3-4 times a day for 2 weeks. and tanning beds for 2 weeks. Do NOT wear rough scratchy clothes on tattoo. Wash hands well with anti-bacterial soap. Soak piercing for 2-5 minutes with clean warm water. Wash 4 inch area around piercing with anti-bacterial soap. 5-10 times. Under running water, rinse turning jewelry 15-20 times. Apply salt water after each washing for first two weeks. Apply anti-bacterial ointment twice a day for 7 days. Keep fingers off new piercings. Do not use rubbing alcohol, peroxide or Neosporin. it can irritate the new piercing and slow the healing process. Apply Bandaid at night for 1 week. Rince with Listerine for 1 month. Use Ice for atleast 3 days, it will reduce swelling. Use Glyoxide to reduce irritation. Be careful chewing, you can chip a tooth. stay swollen for atleast 1 week. Dont be alarmed. please contact Billy Jack for express permission. 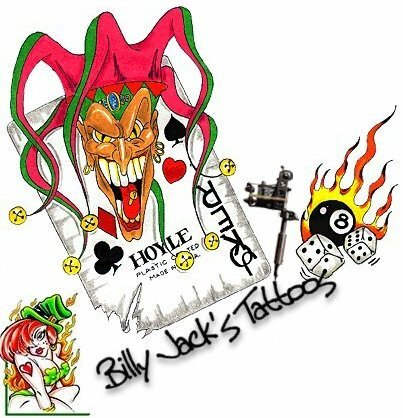 Website �03 Billy Jack's Tattoos. All Rights Reserved.